I’m putting this up again because it’s prime gardening time. Have you seen “Earth Boxes” sold as self-watering planters? They work well, but they are pricey (starting at about $33 for the small ones). Here’s an easy DIY version that is quite a bit cheaper. Save some money on your water bill and cut down on your watering chores at the same time! 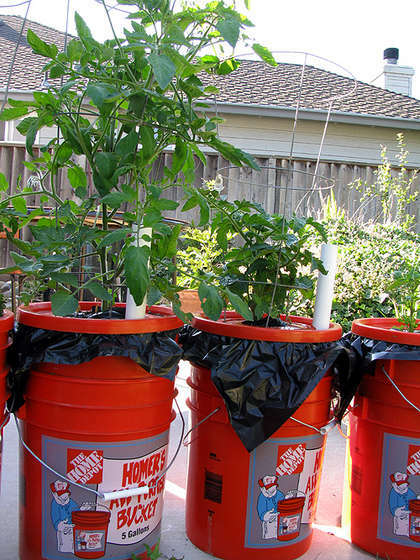 If you have a couple of 5-gallon buckets from the home improvement stores you can put them to good use with this project. It’s like an Earth Box, but the poster calls it the “Dearth Box” because it works so well with a small amount of water. It just keeps recycling the water, so you don’t have to water nearly as much as you ordinarily do. If we get an extra hot summer this year, this could make big difference to your plants. Apparently you can grow some pretty big vegetables with this system. A good deal all around. Click here to link to the Instructable. Maria I’m so glad! I think these are pretty awesome myself. And so much cheaper than the ones you buy! Happy gardening my friend! This is just what I’ve been looking for. I am going to make about ten of them and write about them on my blog. Thank you! Anon, I love your tips for cleaning the frosting out. Good old Dawn dish soap! Yes, easy and free is a big plus. Thanks for sharing your expertise and I hope to see you around the blog some more. Maybe even with a name? All the major grocery stores in my area give these to me for free. I just stop by the bakery and ask if they have any. I just have to clean them out. To clean them, I take them out on the lawn, scrape out whatever was int here – typically frosting. With frosting being mostly shortening, to get out the grease, I squirt in some dawn dishwashing liquid, add some water from the hose(the cold water does fine), then use a scrubby sponge and just scrub them out. Sometime I let them sit a bit as the frosting around the top edge can be dried on and easier to remove with a little soaking time. Once scrubbed out, I hose them out and let them dry. The lawn loves the detergent and the frosting doesn’t hurt it either. Easy and free! Two of my favorite adjectives! This project can be free if you can recycle some old buckets you already have or get some free buckets from a bakery (frosting comes in these) or other business that just throws them out. Free is good! A Twitter friend says they are going to make the buckets a crafting project with the kids. Love it! I’ve seen these buckets covered in burlap and then tied on with twine. Burlap is easy to craft with, but I’d love to know how their buckets turned out.! What a great idea to get the kids involved in growing something! Take photos of the buckets AND all the produce they grow. Making memories, teaching skills, and having fun! Thanks so much for sharing this idea TCU! Thanks, Keens! If you have a balcony or patio you can even do this in an apartment. And I love the “win win” every time!